A basic government responsibility is to secure maximum value for money from the O&M of a country’s existing infrastructure assets. Governments can adopt various strategies to optimize the socio-economic returns generated from those assets; the framework in Figure 8 offers a structured overview of management strategies (represented by the outer circle) and enablement strategies (represented by the inner circle). Increase the utility of the existing infrastructure asset, by maximizing its utilization and enhancing its quality for each user. Decrease the total costs of providing the infrastructure service – not just by reducing internalized O&M costs but also by mitigating the environmental and social externality costs. Increase the lifetime value, either by extending the asset’s life to maintain the benefits over an extended period, or by organizing a rehabilitation, replacement or upgrade plan that takes whole life-cycle considerations properly into account. Some of those levers can be interdependent. While in certain situations trade-offs will be required between the different strategies (for example, reducing operating costs may reduce service quality), governments should seek win-win solutions that assure a simultaneous realization of those strategies (for example, e-tolling reduces both operating costs and the environmental footprint, while increasing quality for users). Above all, it concerns the political will to implement those best practices. The issue is not about a lack of best practices or too little technological innovation; it really has to do with the structure and the will to adopt the lessons learned and apply them on a broader scale. 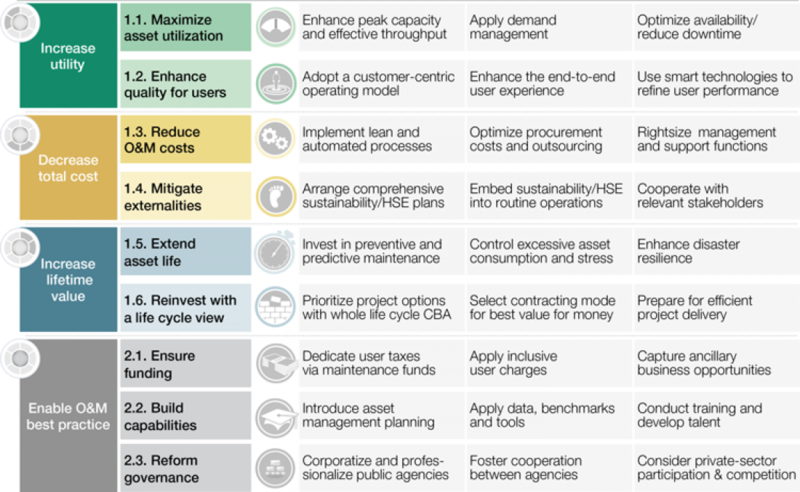 Based on extensive consultations with the multistakeholder constituencies of the World Economic Forum’s Strategic Infrastructure Initiative, this report identifies and discusses 27 actionable best practices and critical success factors that are essential when undertaking the O&M implementation and enablement strategies (Figure 9). Figure 9’s checklist represents a holistic or ideal agenda for optimizing O&M. Although it shows how complex and broad O&M can be and needs to be, it certainly does not imply that successful O&M is unachievable; many countries and sectors have accomplished much by simply concentrating on those aspects most relevant to their particular context. While many governments and operators are already well advanced in some of these levers, they often fail to consider all the levers systematically, and so fail to reap the full potential of optimizing their existing infrastructure assets. Many of the implementation best practices can provide quick fixes and are essential for short-term improvements, as they can be implemented relatively quickly if the right engineering and operational know-how is in place. For many countries, however, the greater long-term issues are about securing continuous O&M funding and establishing the right governance structure – factors that are of paramount importance for any sustainable O&M solution. The rest of this report is organized according to the O&M critical success factors/best practices. Part 1 of the report, intended particularly for managers of public infrastructure assets, discusses the management best practices for optimizing existing infrastructure assets; it is subdivided into six chapters (1.1 to 1.6) with a total of 18 best practices. Part 2, intended primarily for policy-makers, provides guidelines and recommendations for creating the right enabling conditions so that O&M can be optimized in a holistic and sustainable way; it consists of three chapters (2.1 to 2.3) with nine best practices overall. The report aims to explain the basic principles of a comprehensive asset management (Box 2) capable of optimizing existing infrastructure assets and making them fit-for-purpose for societal needs. However, the report is not meant to provide detailed technical guidance on implementing such O&M best practices in any specific infrastructure sector. Given the report’s cross-sector scope, the best practices listed will apply to all infrastructure sectors. Value perspective. 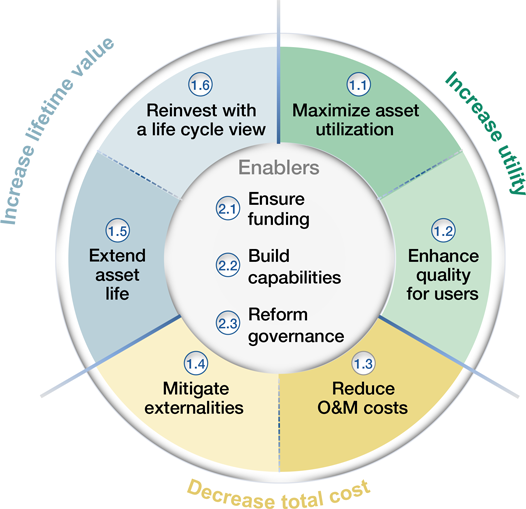 In some traditional approaches to asset management, the emphasis is on minimizing the total cost of owning and operating fixed capital assets (while providing the desired level of service).41 The framework in this report implies a wider agenda; a well-configured infrastructure asset should not only minimize cost but also provide the greatest possible life cycle revenues, user benefits and, hence, aggregate socio-economic returns. In this comprehensive version of asset management, governments should transition their view of O&M as a “cost burden” to O&M as a “value creator”. Triple bottom line objectives. Comprehensive asset management not only attends to operational and financial goals (internalized costs and benefits), but also explicitly considers environmental and social dimensions (externalized costs and benefits). Whole life-cycle horizon. The proposed approach does not limit itself to annual cycles, but engages in whole life-cycle analysis and decision-making. Risk recognition. As in financial asset management, infrastructure asset management needs to optimize risk-adjusted returns – securing a maximum return (e.g. throughput, user quality) at a given acceptable level of risk (e.g. downtime, congestion, resilience). Systemic scope. Good asset management is concerned with system-level performance, not just with performance at asset level. Integrated activities. Good asset management involves more than effective maintenance; it is not just a traditional maintenance programme “on steroids”, but a means of operating, managing and optimizing infrastructure assets centrally, and in a smart way. Comprehensive measures. While this report recognizes the central importance of funding for O&M, it also encourages stakeholders to put some effort into other essentials, such as getting more out of the provided funds through operational excellence, which in turn reduces costs. Advanced asset management not only involves operational levers to improve efficiency, but also addresses other strategic business objectives of the asset owner to improve effectiveness. Rather than just focusing on short-term fixes, stakeholders should also concentrate on measures that “enable” O&M for the long term, i.e. developing appropriate funding, capabilities and governance for the asset. Organizational integration. Good asset management avoids creating silos for maintenance management and budgets. Instead, it conscientiously integrates and interconnects maintenance with design, engineering and construction, and integrates maintenance planning with operations planning. Proactive attitude. Asset management needs to be proactive and innovative, instead of reactive and taking a formal approach. It should drive fact-based reviews of the asset base, suggest innovations and dynamically adjust its processes and organization to new issues. This report illustrates the best practices with support from over 200 examples and case studies to give the reader a real-life impression of successful implementations. The examples are drawn from different sectors of economic and social infrastructure, and from both developing and developed countries. Part 4 contains a comprehensive case study of the Panama Canal O&M, which holistically exemplifies the full array of both implementation and enablement best practices. Figure 10 provides an overview of the O&M measures taken at the Panama Canal along the dimensions of the O&M framework. 40 For a detailed discussion of infrastructure asset management, refer to: Uddin, Waheed et al. Public Infrastructure Asset Management. Second edition. New York: 2013. 41 Impediments for Implementing a Sound Asset Management System. March, 2013. Rutgers: Center for Advanced Infrastructure and Transportation – State of Good Repair Summit.